Whilst on vacation in Cancun I thought it would be fun to spin up a thread for the 2500. We all (at least mostly I think) love the Planet Ocean. And while 2500 v 8500 is sometimes debated and there's all sorts of speculation around what's next for the PO line at Basel 2016, I'm finding newfound appreciation for the original 2500. Here's a photo to start. More to follow. Cheers! I hope everyone is having a great week!! EPmac, iinsic, Split Second and 21 others like this. Love my 2500 XL - classic looks and thinner than the 8500 as well. I only wish they'd make a clasp with micro adjustments, that would make it perfect for me! Last edited by KayGee; January 29th, 2016 at 19:30.
copperjohn, ccm123, Killarney and 3 others like this. Not fair while so many of us are still at work (in the Americas, anyway). I'm jealous. Nice watch, too! Titan II, ccm123, Killarney and 3 others like this. Here was mine, a 2500D XL size. It's now sold though and I have moved on to a 42mm titanium 8500 caliber. I liked this one a lot but I like the 8500 better. Titan II, copperjohn, hchj and 7 others like this. Just can't beat the original PO! I didn't take to the PO when it was first released. However it grew on me and is now the one watch I own I would keep if all others had to go. I've had it on the mesh for most of the time I've owned it. I've just ordered the PloProf clasp to go with the mesh to gain some security and micro adjustment. Enjoy Cancun and try to relax. Titan II, copperjohn, Split Second and 7 others like this. I own two 2500 PO XLs. I couldn't decide between orange and black. I love my black PO it's my first Omega and still my favorite. Recently put it on mesh and love it even more. It's an amazing watch thin, accurate and classic styling. Titan II, copperjohn, NMGE17 and 11 others like this. NMGE17, Titan II, ccm123 and 6 others like this. 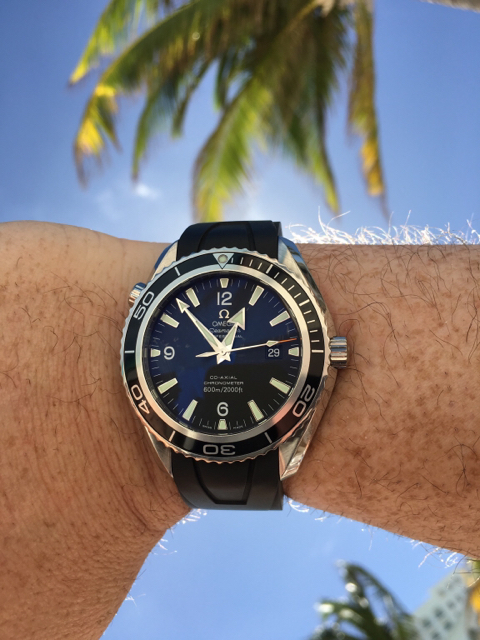 Planet ocean 2500 or new 8500 ? All times are GMT +2. The time now is 16:28.